I have never managed to get into digital music for several reasons. I don’t like wearing headphones, I get paranoid as I hear people calling my name in the background, and I think that they distract people’s attention. This is really noticeable while I am riding my bike on the pavement with the kids. People who are walking while listening to headphones are less aware of their surroundings, they tend to zig zag while they are walking and they cannot hear you coming. This report in Businessweek addressed the problem a few years ago, although it has many methodological issues, and this article on the Treehugger website offers similar data while raising some good questions about the intentions and interpretations. In Kenya they seem to be taking the problem seriously and in fact it will soon be a traffic offense to cross roads in Mombasa while wearing headphones or on the phone if legislation proposed by the Mombasa County Assembly is approved. So no headphones means I don’t have one of those miniature storage devices to listen to. But I have never really got into digital downloads either. The problem there is quality. 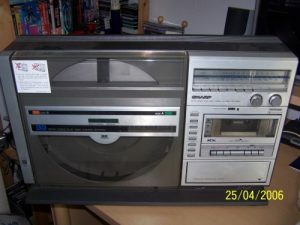 I like vinyl, take a look at the photo below of my record player. This is a beautiful machine, 1983, plays both sides of the record, sumptuous quality, style personified and even comes in a portable version (mine also runs on batteries but the speakers don’t attach as the portable versions do). So I have never had a system to play digital music that is half as good as this, although recently I have got closer with the Studio Pro 4 speakers that I found by the side of the street here in Cambridge (see this post for details). But even taking that into account, the sound is just not the same. I have a vinyl and CD copy of the Beach Boys 20 Golden Greats, and playing the two together the difference in enormous. The digital version is sharper and the sounds are purer, but that was not what the boys had in mind when they were recording it. On MP3 the differences are even more noticeable. But convenience rules nowadays, and streaming of low quality music reigns. Now Niel Young is with me on this, as are Sting and various other musicians. 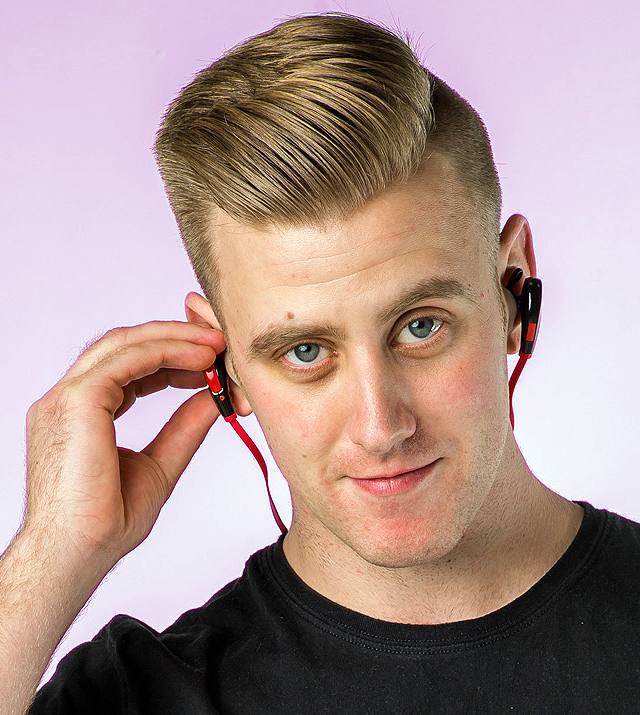 Niel wants to offer high quality music reproduction to people like me, and is preparing to launch his new baby Pono. The player looks a bit like a regular MP3 player, but the files are much bigger so not as easily stored or downloaded, but the quality is much higher (say those who are marketing it). You can find some statistics in the article above. The data would suggest a vast improvement in quality, but as ever the proof of the pudding as they say. And there is a cost issue. The player will cost about $400, and an album maybe $25. This is obviously marketed at people who have some disposable income and are looking for quality, probably musicians in their 40’s just like me. We might wonder how big the market is, but if we note that the project raised about $2.5 million on Kickstart in a few days, maybe there is enough money and enough people around to make it a success. So the question is for the technology community, will you (or more importantly I) buy it? Previously I have reviewed the Pocket Boom, a cool little device which can turn virtually any device into a speaker. Recently the same people asked if I wanted to review a SoundWear SD10 Bluetooth Stereo Headset, so here I go! Please note, like with the Pocket Boom Review, all the opinions in this article are mine, and are completely honest – I am not being paid to write this review. 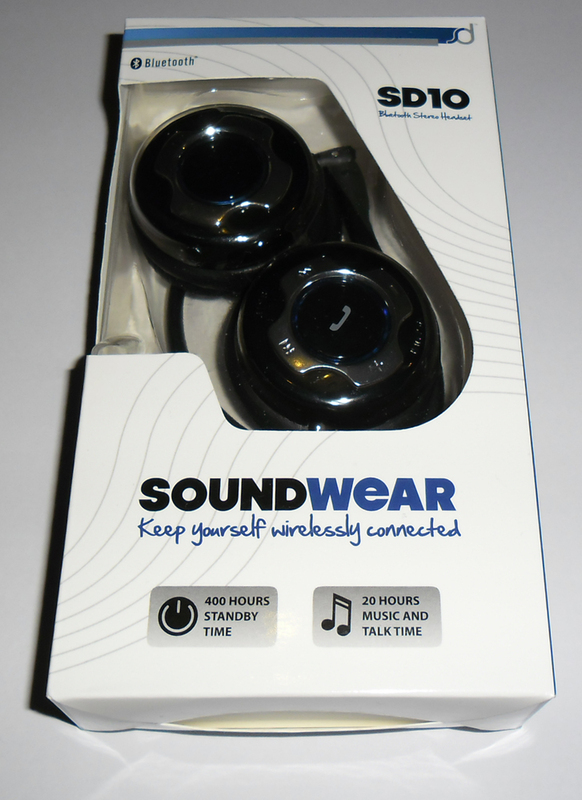 The SoundWear SD10 Bluetooth Stereo Headset is a device which provides wireless headphones, which can synchronise with almost any Bluetooth device. 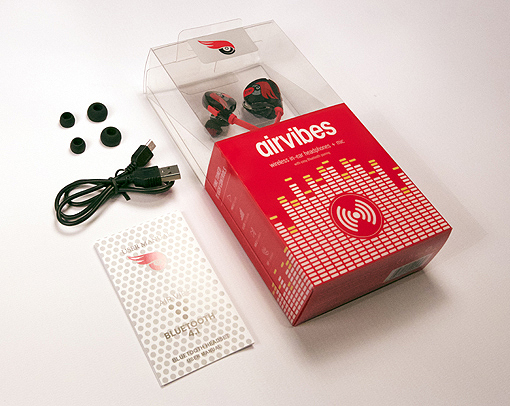 This means that when you are out and about, you can take calls, and listen to music, without the limits of wires. The headset very cleverly folds away quite neatly, which does mean that they can fit into your pocket without much of a problem, meaning they are portable, like you need them to be. So, are the headphones comfortable to wear? My answer would be it depends who you are. I have tried them on, and I have got other members of the team and some of my friends to try them on, and the responses you get are mixed. Some people have no trouble whatsoever, the headset fits snugly onto their head, and are very comfortable to ware. Other people have tried them on, and they do fit, they are just a bit more awkward. Maybe that’s something you might want to consider – especially as they are not retractable/adjustable. 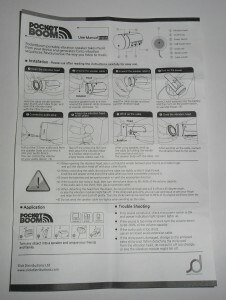 Like with the Pocket Boom, if you don’t read the instructions, you aren’t going anywhere very fast! Read what the small A5 (ish) sheet of paper tells you, and things become pretty simple. With some phones you need to fiddle with some settings either with Bluetooth, or on audio tracks to get them to work properly with calls and music, but it does work! Obviously one of the most important things with all headphones is the sound quality. You can get the most amazing headset, but if it has poor sound quality, then there is little point to it. So what about the quality of the audio stream produced by the SD10 Bluetooth headset? Well it is actually very good! 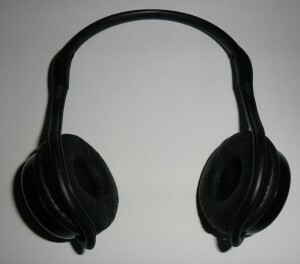 The headphones fit very snugly around your ears, reducing any noise interference, and the audio quality is very respectable. Obviously noise cancelling headphones, or recording studio ones would be better, but the quality is very respectable, especially as it is coming from a wireless stream. For the average music listener, I don’t think there is any need to worry about poor sound quality. The headphones do come with instructions, which are clear, and just require a small amount of common sense and logic to use. They are helpful, but could contain a little more info – possibly room for an FAQ’s section. From what I have seen of the headset, it seems to last a reasonable amount of time between charges. You don’t start listening to a tune, and then a call comes in, by which time the headset has given up and is needing a charge. The battery life seems to be pretty good, so no need to worry about that. The issue I have with power is the way you charge the headset – via USB. You can only charge it via USB, and there is no alternative, no batteries you can replace etc. This can be a little inconvenient, especially as it doesn’t come with a USB plug adaptor, but I am sure it will work okay with the one I use for my iPod, or the one I use for my camera. Don’t take my word for that, I wouldn’t want to blow your headset – if you have one or are getting one! 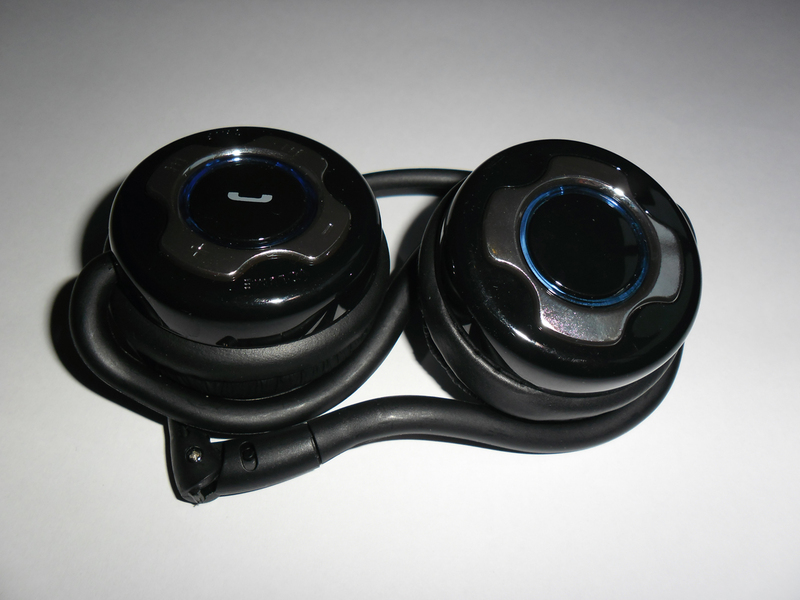 Here comes the killer question: is the SoundWear SD10 Bluetooth Stereo Headset value for money? I try to evaluate every product I review using value for money, so it is a good test. The headset retails at £24.99, which is reasonable, but I think it depends what you need it for. If you are going to be making calls wireless and listening to music, go for it. If you just want to listen to music (like me) then I am not so sure. 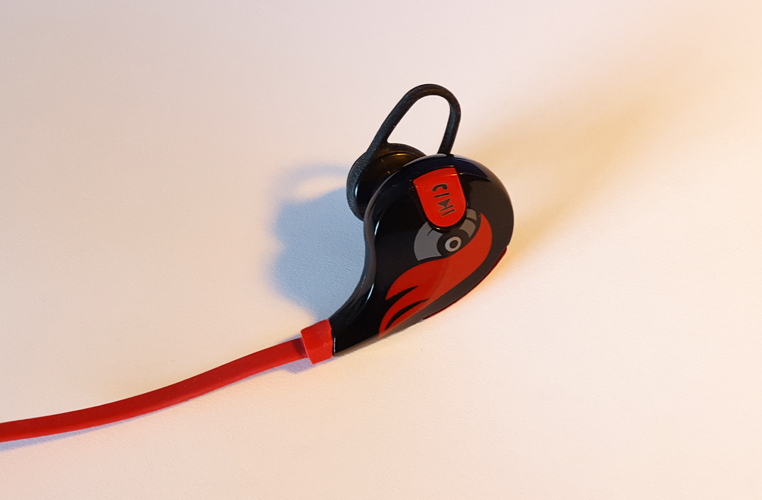 There are different headphones more suited to music listeners, but this set does give you the added bonus of being able to make calls. Interested in buying a set, or just want to read a bit more? 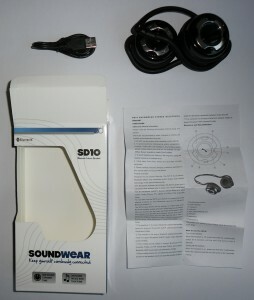 Check out the SoundWear SD10 Bluetooth Stereo Headset on Mobile Fun’s website. 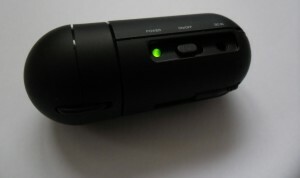 As I said at the beginning of the article, this product has been sent to Technology Bloggers to review. Our thanks to Mobile Fun who provided us with the headset. A week or so ago, a company approached Technology Bloggers and asked if I would be willing to review some of their products. I thought that this could be some fun, so I emailed them back saying: why not! 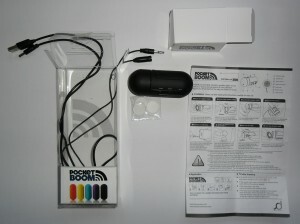 They then send me a Pocket Boom to test and then review – this article is that review. Please note, the opinions in this article are mine, and are completely honest – I am not being paid to write a review for them. What is the Pocket Boom? The Pocket Boom is a device that can turn pretty much any surface into a speaker. You just plug in your music – be it from your iPod, computer, tablet, stereo or whatever (anything that has a 3.5mm headphone jack) and place the vibrating speaker onto a surface, and it will vibrate the surface to turn it into a speaker. What Surfaces Does the Pocket Boom Work on? Metal – due to its ability to vibrate, metal is one of the best materials I have tried, filing cabinets, kitchen hood extractor fans, hole punches, beds, and much more! Thin plastic – tubs, especially DVD (and Blu-Ray, Wii, PS3, Xbox etc.) cases and even washing baskets! You may be wondering if it actually works, it seems too good to be true. Can the Pocket Boom really: turn anything into a speaker, turn anything into an amplifier; and turn anything into an equaliser? My answer is simple. Yes. You can be sceptical, but I have one and it does. As I mentioned above, some surfaces it really surprises you by how well it actually transforms that object into a speaker, whilst with others you can be left somewhat disappoint with the sound level – but never the less it does turn it into a speaker. From my personal use of the speaker, I would say that I think it works amazingly well on around 15% of objects, well on 70% of objects, and rather disappointingly on the other 15% of objects. So around 85% of objects to hand should be able to be converted into a good speaker pretty easily! Clearly a lot of work has gone into designing the Pocket Boom, it has some great ideas behind it. The ergonomics need some tweaking before the product is 100% perfect. The 3.5mm headphone jack lead that comes out to plug into your device is way too short to be practically used with most devices. That is a major flaw, but this has been fixed, as included in the box is an extender lead, so you can get an extra 40cm (ish) of reach. Inserting the batteries is really easy, literally slide back a cover, put them in and slide the cover back on. Dead simple. 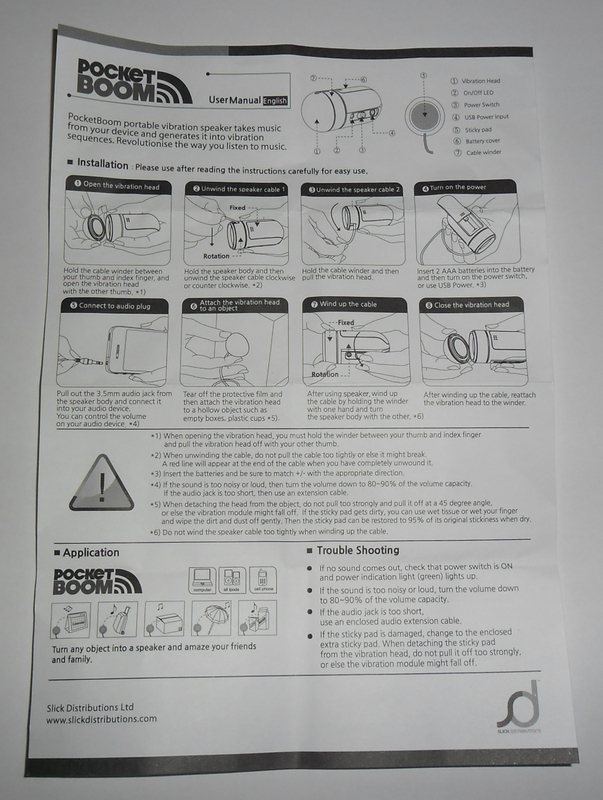 The enclosed instructions do tell you how to pull out the speaker wire, so that you can place the vibrating speaker head on a surface, however I found them very hard to follow. I found a video on YouTube about how to do it though, and that cleared things right up, just pull the wire out whilst rotating it round at the same time – effectively pulling and unwinding. One thing that I am still a bit puzzled about is the suction pad system. The speaker head has an adhesive suction pad on it so that you can stick it to surfaces easily. It does get dirty, and I have found that covering it with sellotape and then slowly removing the tape cleans it up and it becomes sticky again. In the pack some extra adhesive are provided, however I can’t seem to find any instructions as to how to change the pad. Hopefully when I need to it will be pretty easy. I have so far been very pleasantly surprised by the life of the battery. Considering this is a device that is designed to effectively replace most speakers, it uses very little power. 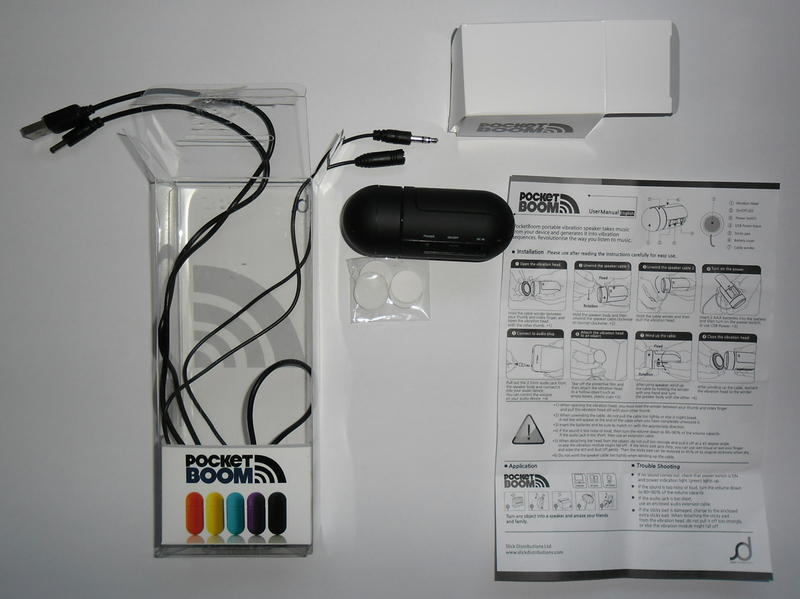 Normal speakers can be power hungry, however the Pocket Boom takes just two AAA batteries. I have had my Pocket Boom vibrating and turning objects into speakers for around three hours now, and despite it being powered by just two AAA batteries, it is still working just as well now as it was when I started using it. The Pocket Boom would appear to be a great saver of energy, considering that two speakers would be unlikely to last that long, producing the kind of sound levels that the Pocket Boom can. Okay, so it is portable, can turn almost anything into a good speaker, uses less power, therefore its weakness must be in its sound quality right? Wrong. Personally I am very impressed with the quality of the sound the Pocket Boom can produce. I have used it on many surfaces, and found that everyone produces a slightly different quality, pitch and intensity of sound. Some produce music with much deeper bass levels, whilst others just produce really loud music! Some substances I would like it to go louder, but the volume level is always reasonable. Depending on the song you are playing, the sound produced will vary. Sometimes you need to turn the volume down slightly, as the speaker head vibrates too much and doesn’t sound that great, but turning down the volume easily fixes this. One thing I have noticed about the Pocket Boom is that it works better in quieter environments. Also, the size of the room seems to affect how well it produces sound, as it can really affect the acoustics. I have personally found that it works far better in small rooms than it does in bigger ones. If there is also a lot of noise, it doesn’t work as well, but for most environments it works really well. I currently have it plugged into my PC, using the machine (metal) as the speaker, and it works really well. The environment is relatively quiet, and the volume of my PC is only on 20%, yet the sound is much louder than if it were through headphones! Is the Pocket Boom Value for Money? When I reviewed the Kymera Magic Wand I bought, I concluded that it was a great novelty product, but not really value for money at £50. I think the Pocket Boom also has some novelty element to it, which you get when you first use it. I ran around testing it on everything I could! That has slightly worn off now, but the product is very practical and does work. As I said, I am using it as a speaker for my PC, and it is working very well. 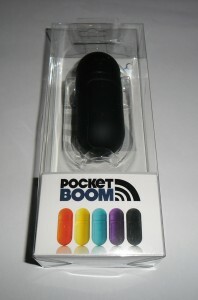 The Pocket Boom retails at £20 (£19.99) which I think is a very reasonable price. I think that the novelty factor of the boom is probably worth £5 to £10, but after that you have an extremely practical product, which you find uses for in your every day life. If you prefer to listen to high quality music, amplifiers and professional loudspeakers are probably for you, the Pocket Boom is not the best of speakers, but it is a bit of fun. If however you are someone who just likes to casually listen to music, and the occasional bit of fun (as you find a new surface to try out!) 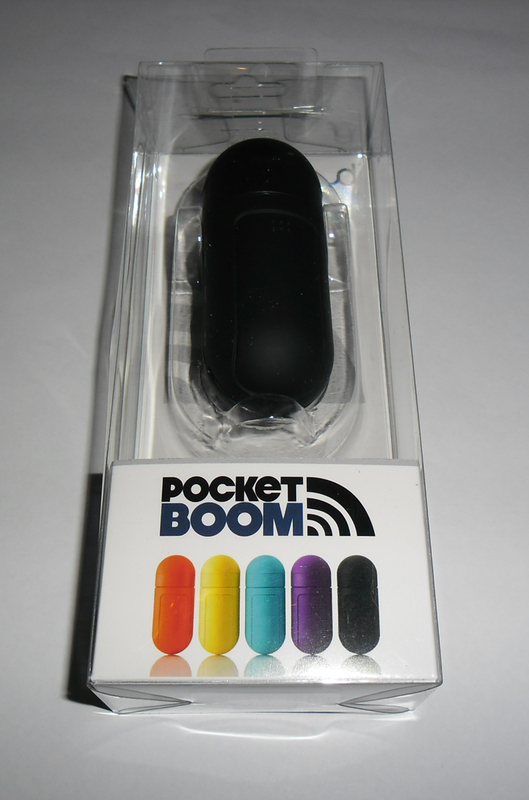 then the Pocket Boom is a must have gadget!